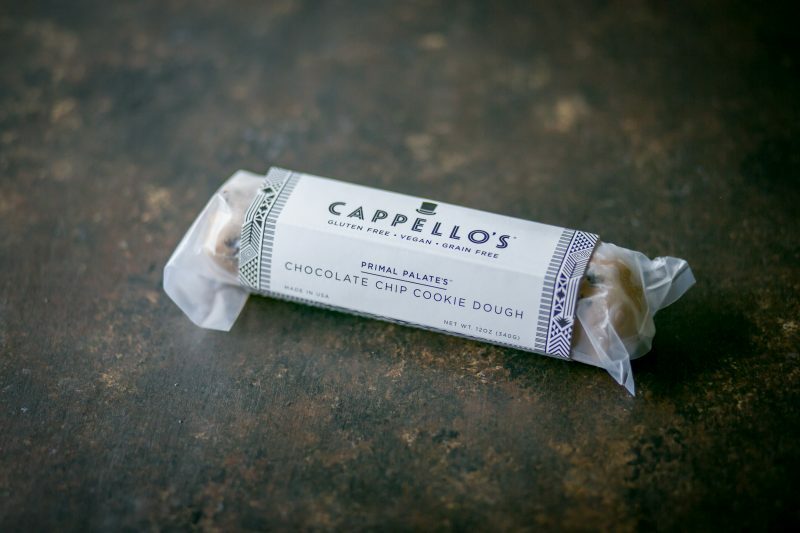 Many of you know that we paired up with Cappellos 3 years ago to produce our famously delicious Chocolate Chip Cookie Dough. You can always rest assured that if you have a roll of the dough in your freezer, you’re ready to make dessert in a moments notice. 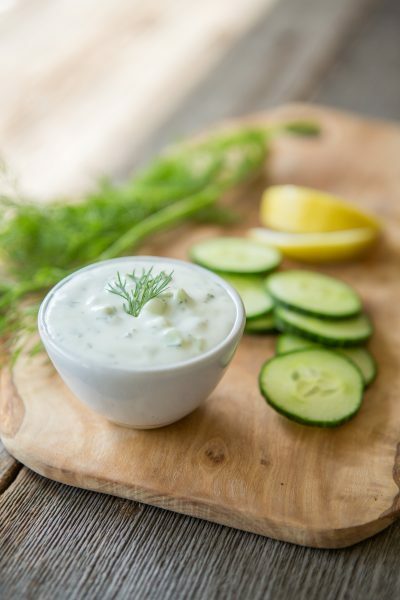 That’s not always a bad thing, when you have friends that drop by for dinner, or need something to take to a party in a pinch. Today we’re giving you a recipe idea that would be perfect for a Halloween Party that won’t rob you of 2-3 hours. 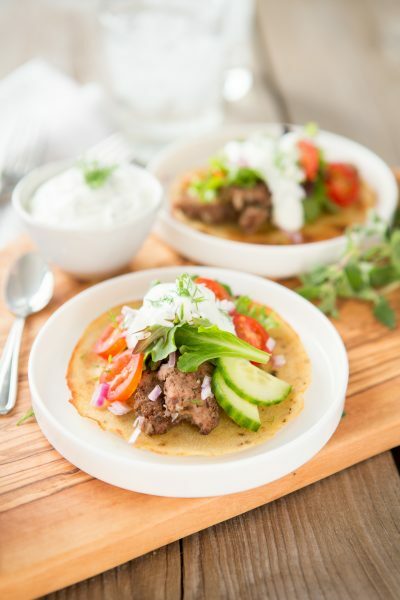 In fact, you can make this recipe start-to-finish in less than 20 minutes. It’s pretty easy, and people will really enjoy it! The first thing you’re going to do is cut your cookie dough roll into 12-14 rounds. If you want to make minis, cut those 12 pieces in half again. 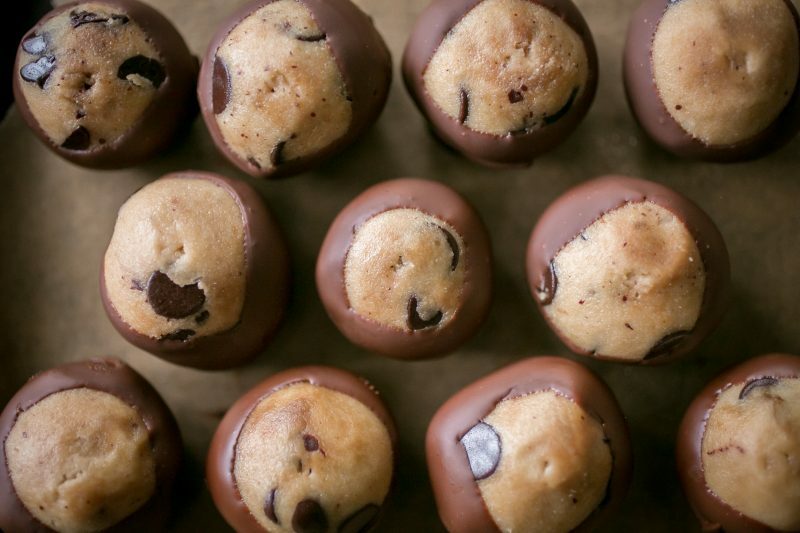 But the full size cookie dough balls are two-bite treats, and perfect for a party. After rolling the cookie dough into balls, melt 3/4 cup of chocolate chips and 1 tbsp of palm shortening (or coconut oil) over low heat. Just enough to melt it completely and create a smooth chocolate sauce. Then remove it from the heat. Using a toothpick, dip to cookie dough balls into the chocolate, and cover them 3/4 of the way to the top. Allow the excess chocolate to drip off, then place them on a parchment lined sheet. You can use the toothpick to generally cover the hole back up, which is a nice touch. 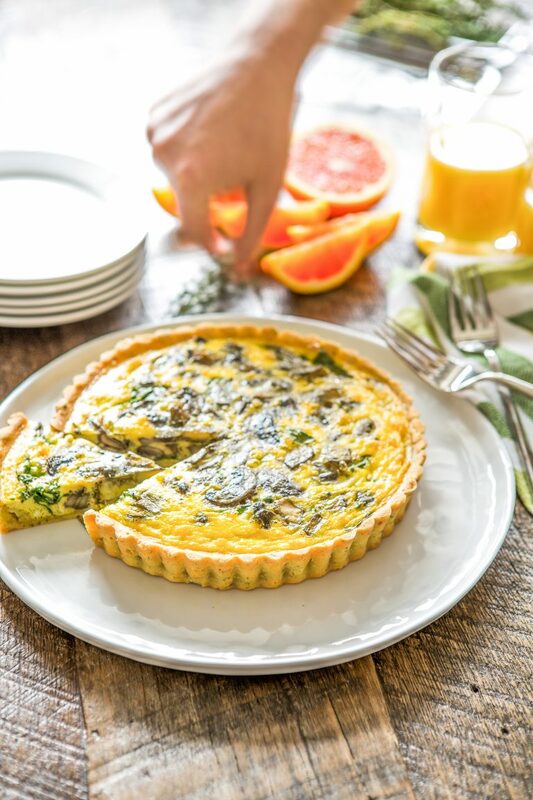 The result is a nice dessert you can take to a dinner, party, or potluck. 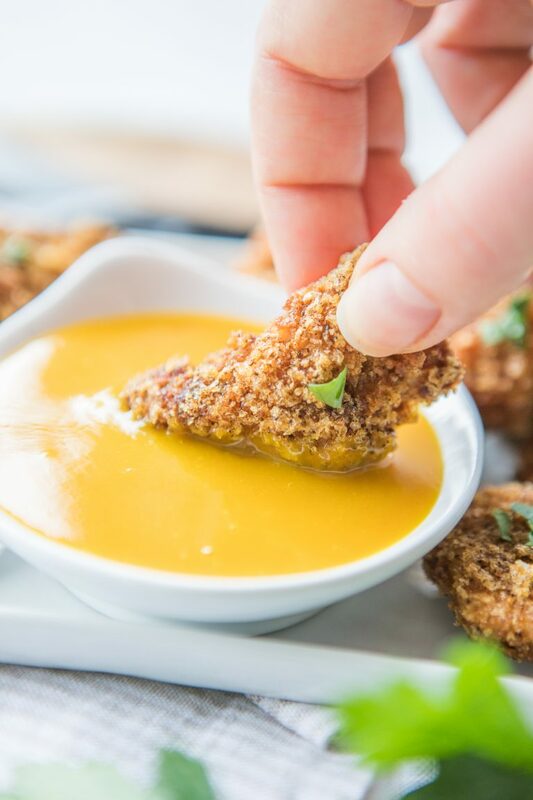 Chill or freeze them until serving. Enjoy! Hope you all have a wonderful Halloween! This treat is super simple to make, and an easy and fun dessert for a party. 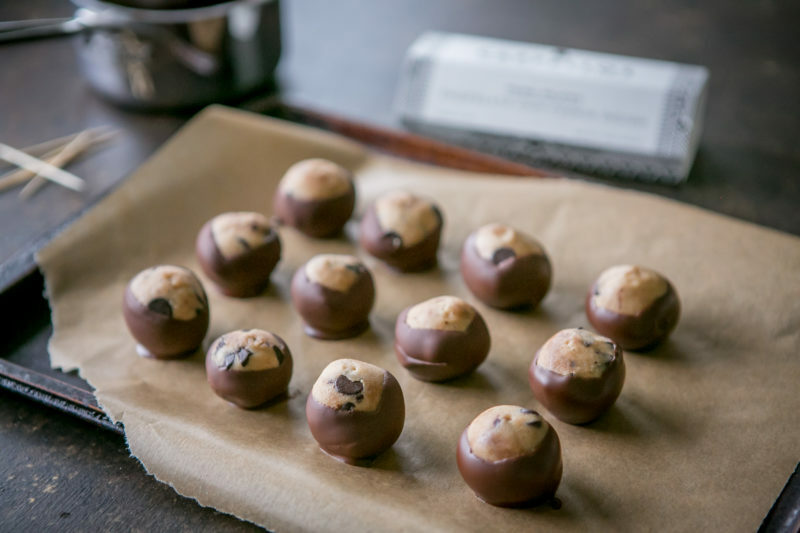 With a little twist on the classic Buckeye recipe, you can have treats for a crowd in no time at all. 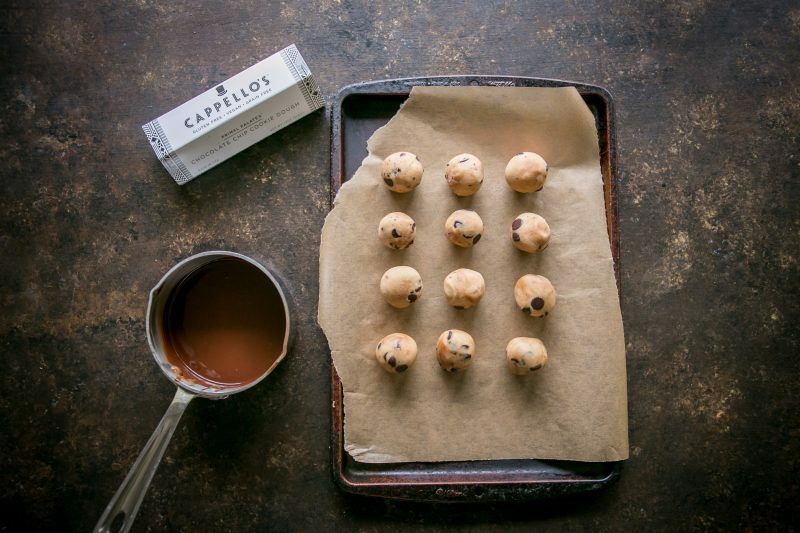 Begin by lightly thawing one package of our chocolate chip cookie dough (made by Cappellos). You can get this online, and also in many stores in the US. 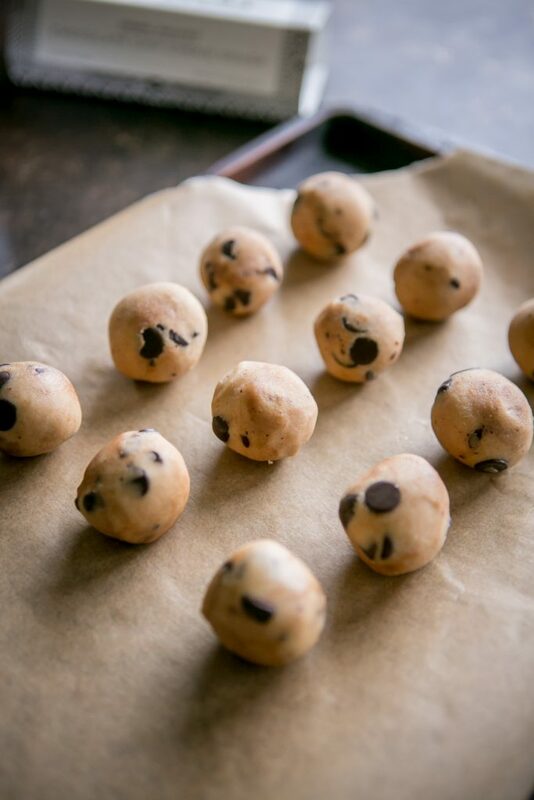 Slice the cookie dough roll into 12-14 equally sized rounds. Roll them into balls, and set aside. Gently melt 3/4 cup dark chocolate chips and 1 tbsp of palm shortening (usually marketed as Vegetable shortening) over low heat. Stir frequently until smooth, then remove from heat. 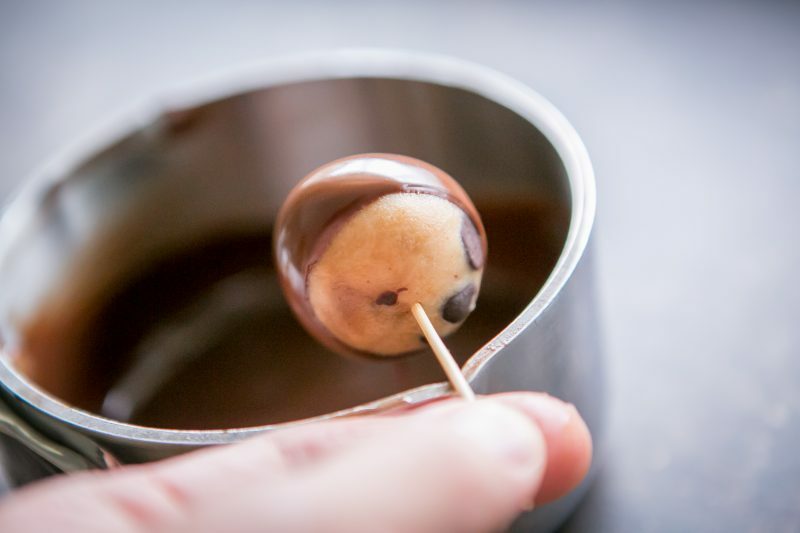 Using a toothpick, dip the cookie dough balls into the melted chocolate. 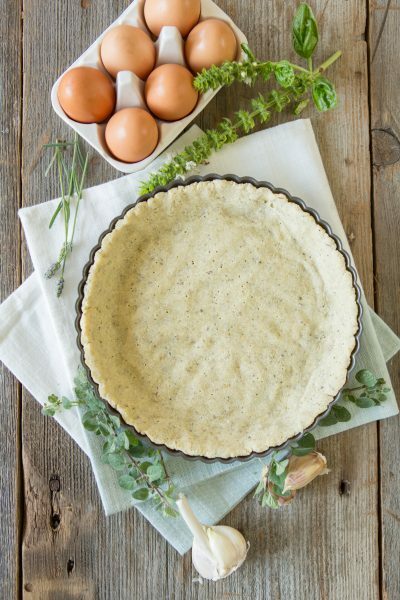 Allow as much to drip off as possible, then set on a parchment lined cookie sheet. 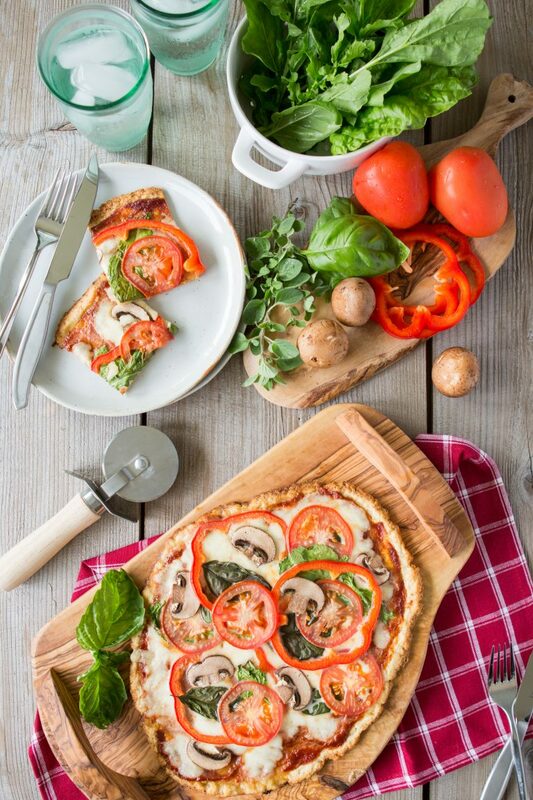 Chill or freeze until serving. Oh nice. Both my kids have Halloween parties this afternoon and I promised I’d bring them some yummy treat, but really don’t have a ton of time today to make anything. (not like I didn’t know about these parties ahead of time! Just been busy and now it’s last minute). 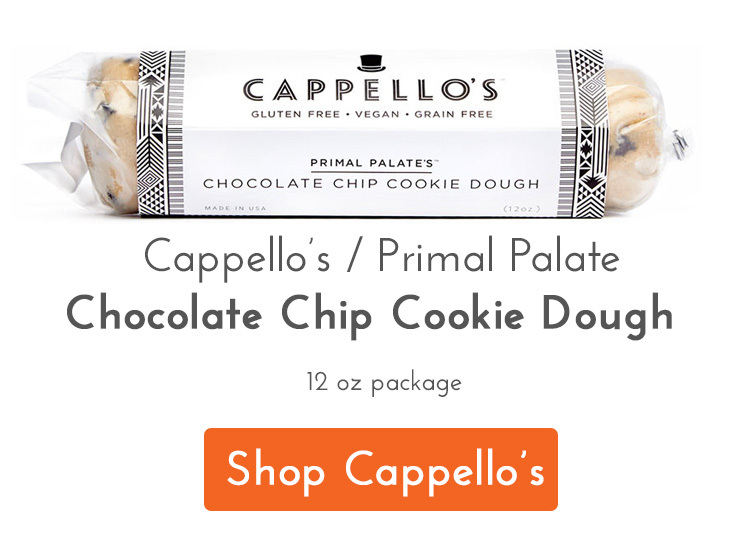 Think these will make a great choice and luckily I have some Cappello’s Cookie Dough in my freezer! Thanks for sharing this at the right time for me 🙂 You guys are the best!